has purchased for us the reward of eternal salvation. This prayer comes from the Breviary and is found on October 7th, the feast of The Holy Rosary of the Blessed Virgin Mary. This special day is also called The Commemoration of Our Lady of Victory. The prayers for October 7th include this prayer in four different places. The Breviary which contains the Divine Office is the official prayer book of the Catholic Church. 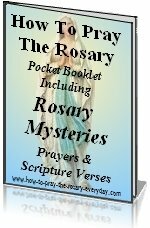 Of course there are prayers that have been approved that are not contained in the Breviary, but this special collection of prayers contains the prayers that are to be said daily by Catholic priests and religious. Regular people are encouraged to pray the Divine Office as well. Compiled within it are many books that were needed to complete the Divine Office. This compilation made it much less burdensome to complete all the prayers and that is why it was given the name Breviary, which means brief. Before this book was compiled in the year 1568, by Pope Pius V, it was rather cumbersome to juggle the many books needed to pray this set of prayers. The Rosary Prayer that begins with the words, "Let us Pray" is taken from October 7th's prayers in the Breviary. October 7th is the anniversary of the victory at the battle of Lepanto. This holiday or feast day was at first called Our Lady of Victory but was renamed Our Lady of the Rosary in 1716. It therefore is fitting that it would be added to the Rosary prayers. As with other prayers, the "Let Us Pray" prayer from the Breviary is a reminder of certain truths of the Catholic faith. Jesus is God's "only begotten Son". When Jesus died on the cross He opened the gates of heaven to all people who believe in Him and keep His commandments. When He rose from the dead, He conquered death. These are the "rewards of eternal salvation." Jesus truly purchased for us by his death upon the cross, eternal life. Nevertheless, you must cooperate with God's grace and follow His commandments if you are to be worthy of this gift from Jesus. It is up to you whether you accept eternal life. In this section of the prayer, you call to mind the mysteries that you just meditated upon. Meditation on the life of Jesus and Mary is the most beneficial form of prayer. Because we must cooperate with God's grace in order to earn eternal life, the following the rewards the Rosary promises are very valuable. They enable us to accept God's grace and follow His commands more readily. 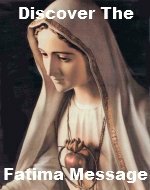 Mary made 15 promises to those who say the Rosary daily. She told these promises to St. Dominic.